Choosing one of the best betting sites to sign up with is never an easy task. You’ll see loads advertised on TV or online, and there are many others out there too. To make things easier, we’ve put together this breakdown of the best sport betting sites for UK residents. We hope it helps you make up your mind! Check back soon for information on the new Betfred sports offer, or sign up right now with a Betfred promo code, you’ll be eligible for bonuses on the other sections of their site like casino and bingo. All of the best betting sites allow you to bet on a wide range of events, but William Hill stands out as number one in this category. You can bet on just about any sporting event you could think of, from the most popular like the Champions League, Grand National or Wimbledon, down to more niche sports like fustal and UFC. What’s more, each event has a whole load of betting markets available to choose from. For example, Premier League football matches have well over 200 different betting markets, the more traditional options like 1X2 or first goalscorer now accompanied by many new creative types of bet and enhanced odds picks. It’s the same story on other sports, where their selection of betting markets generally can’t be beaten. In this day and age, having a great app is an absolute must for the best betting sites. For betting on the go, William Hill is our preferred app of choice. They really go the extra mile to make mobile betting as easy as possible. You’ve got access to every single betting market which you could find on a PC, which often adds up into the hundreds for a football match. Plus, you can manage your account with easy deposits and withdrawals via the app. Of all the apps we looked at, William Hill’s was easily the nicest design and that’s backed up by how intuitive it is too. Trending bets and accumulators can be found quickly when you log in. You can also see trending markets, to follow the most popular bets if you wish. Finally, you can even bet on the app with your Apple Watch, making William Hill one of the first bookies to offer this feature. Keep an eye out for more and more following suit in the near future! Betfair comes out on top again with odds. As probably the world’s biggest betting site, they can afford to be a little more generous with the odds that they give. Our findings have shown that their odds are consistently slightly better overall than their competitors. That’s not all; their promotions for existing members include extra winnings on successful accumulators, which effectively makes the odds even better. Those promos are in place on several different sports, including football, tennis, basketball, US sports and Aussie Rules. Something for everybody indeed! It’s not always a huge difference, but pennies make pounds and over time those odds differences and boosts will add up in your favour. Always remember to compare odds when you have a bet in mind – it’s important to get the highest returns possible. How do I register at an online bookmaker? Signing up to the best betting sites is easy. You will find a sign-up link on the homepage of any bookmaker’s website. You will need to fill in your personal details, create a username and set a password to open your account. You may be required to send in scans of an ID document or proof of address documents to prove your identity. Rest assured that this kind of verification is in line with the requirements of gaming authorities and your information is safe with our recommended bookmakers. Is it safe to make deposits and withdrawals at online bookmakers? We can vouch for all the best betting sites we recommend as trustworthy, meaning they offer secure online payments and will pay out fairly as they are supposed to. 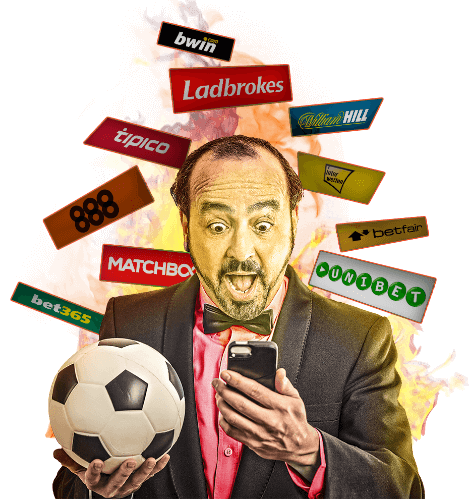 Although the vast majority of betting sites out there are run by honest people, we have heard about instances of rogue online bookmakers causing problems for members. We take any incident of this kind very seriously and refuse to promote any site which is proven to have dealt with members in an unethical way. All the best betting sites offer the option to set a deposit limit over a designated period. As an example, if your deposit limit was £100 each week, after going over that amount you would have to wait until the following week to deposit again. Setting a deposit limit is not mandatory, but it is advisable to make sure you manage your budget correctly. Many bookmakers will prompt you to do this on the registration form.